Show Your Appreciation with Our Delicious Crepes! Home Crepe Blog Gooble Gobble…it’s Time to Give Thanks! October is a wonderful time to enjoy the colourful autumn season and of course, to give thanks. Since 1957, Thanksgiving Day has been help in Canada on the second Monday of the month to give thanks for a bountiful harvest and other good fortunes over the past year. At Thanksgiving, most Canadians enjoy a long weekend with a statutory holiday on the Monday. It’s a time for family gatherings, with traditional Thanksgiving dinners – complete with an over-sized turkey and all the fixins! – held on the Sunday evening. Table leaves and extra chairs are brought out to accommodate everyone, and decorations include pumpkins and gourds, ears of corn, wheat sheaves and other classic signs of the harvest. Don’t worry though, it’s not all about eating… after the Thanksgiving feast, people like to work off a few of those extra pounds through other traditional Thanksgiving weekend activities such as hiking to enjoy the autumn foliage, attending football games – of the backyard and “official” variety – and taking in Thanksgiving parades and fall fairs! A great family outing, the fall fairs offer something for everyone… petting zoos for the kids, craft displays for Mom, giant pumpkin competitions for Dad, and freshly baked fruit pies for all (if there’s any room left!). Our October crepe feature is truly a seasonal sensation! 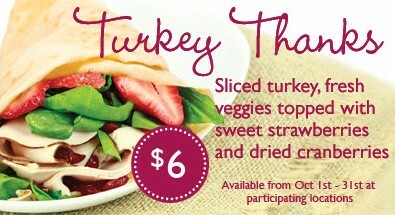 Labeled the Turkey Thanks, this bundle of goodness boasts turkey slices and fresh veggies, and is topped with dried cranberries, and – just to sweeten the deal – tasty strawberries. To the creative chefs at Crepe Delicious, we’d like to say “Thanks for the Thanks”!